Sweatson Klank - Fine Lines. Vinyl LP. Bleep. The LA beatniks at Friends of Friends (Daedelus, Shlohmo) present us with another fine selection of West Coast electronica in the form of Sweatson Klank’s Fine Lines. As one might expect, there is a whiff of Brainfeeder/The Low End Theory to these dozen cuts. 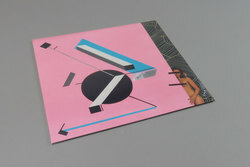 However, Klank’s musical interests clearly extend far beyond the City Of Angels, and the other influences on Fine Lines - UK and US garage, throwback electro-pop and future r ’n’ b to name but three - ensures this LP remains fresh throughout. Imagine a more nimble rendering of fellow Friends Of Friends artist Groundislava. Guests include Anna Calvo and Rite Along.